Shallow fry the cubed goat meat in the oil until brown, remove from the pan and simmer in the stock until soft, 1 to 1/2 hours. (Time can be reduced if using a pressure cooker, also suitable for a slow cooker). Gently fry the chopped onion in the oil, add a small amount of water and simmer the chopped carrots and potato until soft. When the meat is soft and falls off the bone allow to cool. Take the meat off the bone a remove any fat. Thicken the vegetables and stock using gravy granules and the stir in the meat mixture. (The mixture should now be quite thick and will need to pressed down carefully on to the ready rolled puff pastry). Place greased proof paper on a large baking sheet, approx. 34 cm by 34 cm. Lay out a whole sheet of puff pasty, carefully spread the meat mixture on top leaving a gap at the edge of 2 cm. With a pastry brush, dampen the edge of the pastry with beaten egg. Lay the second sheet of pastry on top and crimp the edges with a fork. Brush the top of the pie generously with the remaining egg. 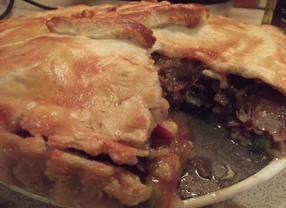 Make one or two small holes on the top of the pie to let any steam escape. Bake in a preheated oven at 180 degrees for 30 to 40 minutes until golden brown.